Structural changes in glaucoma may precede functional changes seen on visual field (VF) examinations. Upto 20% of the retinal ganglion cells (RGC) could be damaged before any changes occur in VFs. 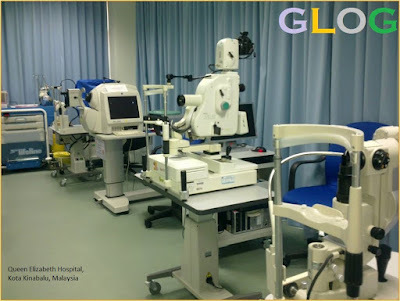 Structural changes in glaucoma have been observed in the retinal nerve fiber layer (RNFL), optic nerve head (ONH) and other layers of the macula. OCT remains the most commonly used technique. It is more efficient compared to HRT and GDx in the detection of localized RNFL defects and changes occurring in the peripapillary area. OCT provides real-time qualitative (morphology & reflectivity) and quantitative (thickness, mapping and volume) analyses of the examined tissues. OCT can be used for evaluation of the corneal thickness, anterior segment (angle) as well as the posterior segment. OCT uses low coherence infrared light (830nm) and is based on the principle of Michelson Interferometry. The long wavelength of the light used permits it to penetrate deep to the target tissue. OCT has evolved from time-domain (TD-OCT) to spectral-domain (SD-OCT). In TD-OCT the path length of the reference arm is varied in time (the reference mirror is translated longitudinally). The repeated movement of the mirror permits repeated scans at different depths. A single coherent measurement focused at a single structure at a given depth is called an “A-scan”. The maximum scan rate can be 17,000 A-scans/second. This provides a 1-dimensional measurement, which is converted to a 2-dimensional image (“B-scan”). Thus, different tissue layers can be acquired in the point of focus. The section of tissue thus obtained is called a “Tomogram”. ( The word tomography is derived from ancient Greek τόμος tomos, "slice, section" and γράφω graphō, "to write"). The image is viewed in real time using a scale of false colors representing the degree of backscattering of the light by the tissues at different depths. A collection of parallel B-scans help to form a “3-D” data set. In FD-OCT the broadband interference (also called the “interference spectrum”) is acquired with spectrally separated detectors. Due to the Fourier relation, the depth scan can be immediately calculated by the Fourier transform from the acquired spectra, without movement of the reference arm. This feature reduces image acquisition time by simultaneous analysis at different tissue depths (27,000 A-scans per second), reducing any errors due to movement and more accurate (upto 2µ). The disadvantage is that light cannot reach the retina in the presence of lens opacities and fixation must be extremely steady. The structures visualized are the result of selective absorption and selective reflection by the structure or interface illuminated by the light. The strength of the signal reflected by a specific tissue depends on properties like tissue reflectivity, the amount of light absorbed by the overlying tissues and the amount of reflected light which reaches the sensor after it has been further attenuated by the interposed tissue. (When the strength of the reflected signal is strong, the scanned tissue has high reflectivity and vice versa) [When the structures are perpendicular to the ray, reflectivity is greatest and produces red images on OCT]. The most reflective structures on OCT are: RNFL, internal limiting membrane, junction between inner and outer segments of photoreceptors, retinal pigment epithelium [RPE]-Bruch’s membrane-choriocapillaries complex. These appear “red” on OCT. The least reflective structures are: Inner- and outer-nuclear layers, ganglion cell layer and photoreceptors. They appear “black” on OCT images. Intermediate reflective structures are: Inner- and outer-plexiform layers and external limiting membrane. These appear “green” on OCT.